Jane Slaughter is a Detroit based activist. Harry Boyte (Chapel Hill, N.C.). Jane Slaughter is a former member of the International Socialist Organization. Labor Notes was founded in 1979, just as the attack on the American working class was about to shift into high gear. The three founders – Jane Slaughter, Kim Moody and Jim West – were members of the International Socialists. In 2009 Jane Slaughter was listed as an endorser of the Center for Labor Renewal. In 2009 Jane Slaughter was listed as an advisory editor of Against the Current, bi-monthly analytical journal of U.S. Trotskyite organization Solidarity . 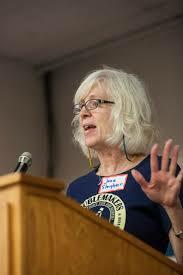 In 2009 Jane Slaughter, Co-founder of Labor Notes, editor of A Troublemaker's Handbook 2, Detroit was a member of the Labor Notes policy committee. This page was last modified on 8 September 2018, at 01:23.